Back not so very long ago - like the 1960's and 1970's - there were no cafes as we know them now or coffee that wasn't instant. In fact I had my first "flat white" (see Coffee explained) when I was living in Sydney while studying back in 1980 !! I'm pretty sure the first half decent cafe in Auckland was at the Palmers Garden centre by the Orakei roundabout in the early 1980's. Things have really changed and its now hard to get a bad coffee in this country and there are cafes everywhere from the humble to the pretensious - but what is hard to find now is places with big selections of our old favourites, simple sitting areas and a lack of the sound of St Gemains "Tourist" coming over the PA. Yes where is the Loiuse cake, the jelly Lamingtons, the Ginger crunch that isn't fifty percent icing and the club sandwiches all like my grandmother used to bake ? 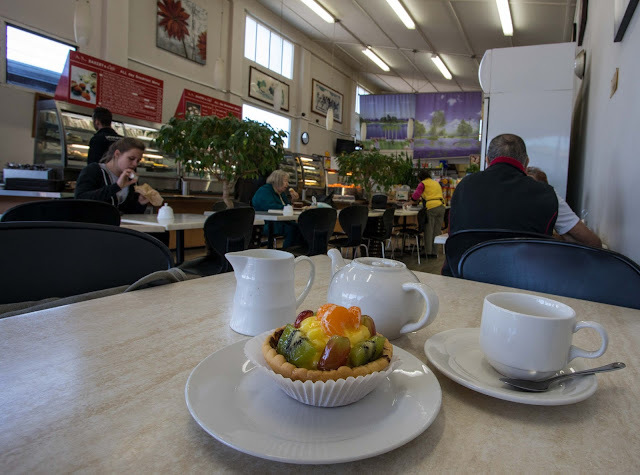 They are hard to find but check out Mr Bon in Helensville , pot of tea (enough for three cups) and a huge fruit pie - yours for $6.50 as I recall. If you look me up on Trip Advisor you can check out my many reviews of local and foreign attractions and restaurants - including Mr Bon ! !